Three candidates for the assistant dean of campus life presented in the Emerson Skybox. The search for an assistant dean for campus life has been narrowed to three candidates, with a final decision expected from Associate Dean for Campus Life Erik Muurisepp this week. The newly-created position is intended to lead a restructured community standards and conduct division. Additionally, the position will serve as one of the primary liaisons with the Title IX office and will facilitate the sanctions panel for sexual misconduct violations, Muurisepp said. He said that after Director of Community Standards and Student Conduct Mike Arno’s early August departure, an opportunity presented itself to combine functions within the Campus Life division. Assistant Vice President of Student Affairs Sharon Duffy led the search committee responsible for finding the new assistant director for campus life. As chair of the committee, Duffy coordinated the search process and serves as the primary communicator between Emerson and the candidates. The committee includes representatives from the Office of Housing and Residence Life, the Office of Student Success, the Office of Diversity and Inclusion, the General Council's Office, campus services, Emerson’s Los Angeles campus, and two students. In an email to the Emerson community, Duffy invited students, faculty, and staff to meet the final three candidates at meetings hosted Nov. 28 through Nov. 30 in Emerson’s Skybox. “In terms of who was selected, it was incredibly important that we had students represented,” Duffy said. She said the committee is looking for someone who can come in, assess the college’s current practices, and develop new plans for future work within both housing and residence life and community standards and conduct. “We’re looking for someone who, through the passion in their work, [can] get our community excited to do more and to do better,” Duffy said. Student Government Association 2019 President Jessica Guida was one of the two students on the search committee process. SGA Chief Justice Ally MacLean said the assistant dean for campus life should be someone who works well with others in the Office of Campus Life. “You want someone that's really adaptable because things do change really quickly around here at Emerson,” MacLean said. According to the job description posted on Emerson’s website, the assistant dean for campus life will serve as the director for residence life, housing operations, commuter student services, and community standards program. “This role ensures a high-quality, holistic and educational experience for those students residing in Emerson College residence halls,” according to the website. Muurisepp, Duffy, and Vice President and Dean for Campus Life James Hoppe made the decision that any director level vacancy in Emerson’s student affairs would be handled by a search committee at the start of this year. Duffy said this provides consistency and efficiency to the hiring process. The college received over 100 written applications submitted through human resources, Duffy said. The search committee reviewed the applications and narrowed the pool of applicants down to 10 for first round interviews. After the interviews, the search committee selected three candidates to be interviewed on campus by students, faculty, and staff . 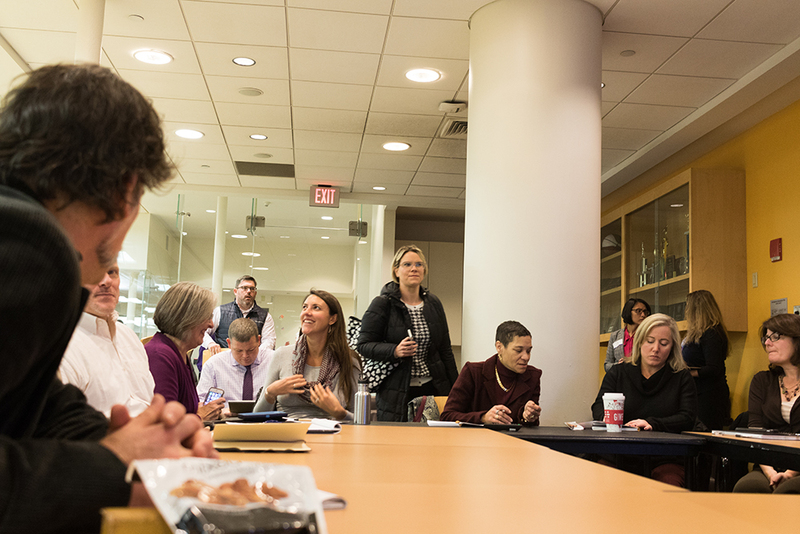 The search committee reconvened on Dec. 4 to review on-campus interviews. They then made a recommendation to Muurisepp, who said he hopes to make the final decision this week. Duffy said she hopes to offer a candidate the position by the end of this week. “We want somebody to start in December so that they have some time to kind of get acclimated before opening in January,” Duffy said, though she said they may not start until 2018.